2019 Camp Triple A: Awake, Act, Aspire! Universal Academy of Pittsburgh is pleased to announce, in cooperation with the Islamic Center of Pittsburgh Center, the 2019 Summer Program: "Camp Triple A"​ ​​for ages 4 and up. Camp Triple A (Awake, Act, Aspire) will take place Mondays through Thursdays, 10:00 am to 2:00 pm, from June 17th to July 4th, insha'Allah. The first two weeks will be at UAP and the third week will be at ICP (childcare before and after is available upon request). This year's camp will be full of hands-on activities impeded in the Arabic, Quran, and Islamic Studies classes. The main themes this year will be Star Peace, Muslims Got Talent, and Mission Possible. Also, students will enjoy a field trip every Thursday of each week, during the camp, at no additional cost. 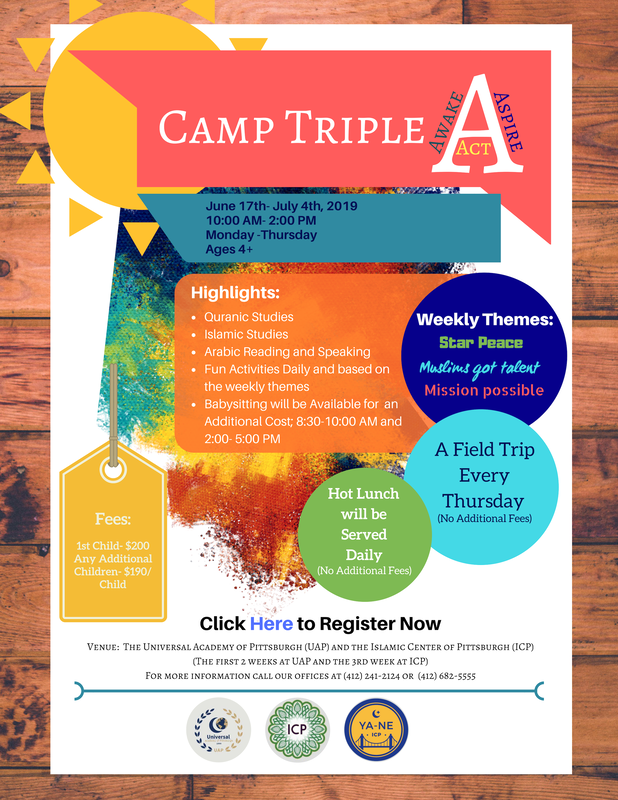 Click here to register your child for Camp Triple A today!